When we talk about innovation it’s easy to come up with the iPad example but the product itself is only one side of the story. We’re just looking at the tip of an iceberg. Have you ever wondered what’s below the sea? Let’s take a few moments to see how this innovation world looks like. Do you remember the first verses of the Bible? What happened in the darkness when our universe, the most amazing innovation, started to exist? It is written that “God said”. Whatever darkness you may face, you will never get out of it if you do not start to communicate. Communication is where it all begins. Being innovative is not a statement or a nice attachment to your logo. It’s a long-term and continuous process. We are challenged to create the business of tomorrow even as we focus on keeping the organisation lean today, with more immediate incremental improvements supplemented by long-term big bets. The key for this process is to enable connections between people and ideas. The tools we now have available are supporting communication more than ever. When you’ve read the word “connections”, your mind probably jumped to social tools such as Facebook, Google+, or Twitter. Indeed, businesses generally consider how to take advantage of these or similar web tools to communicate inside and outside the firm: enabling employee knowledge sharing, providing customer support, building the brand, or marketing products and services. PwC recently launched the “Global Innovation Survey”, the largest and most comprehensive study of its kind exploring innovation from a global, multi-sector perspective. It uncovers insights obtained from interviews with board-level executives from 1,757 companies, across more than 25 countries and 30 sectors, who are responsible for overseeing innovation within their company. 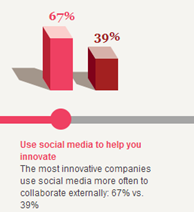 The study shows that the most innovative companies use social media more often to collaborate externally and support the innovation process: 67% (most innovative companies) vs. 39% (least innovative companies) and they are more likely to manage innovation efforts formally or in a structured way: 78% vs. 66%. Moreover, when it comes to developing new products and services with external partners, the most innovative companies collaborate over three times more often. The importance of collaboration can also be seen in the number of companies that are now working with customers or other businesses to co-create new products and solutions. The rapid upsurge in the sale of e-readers and e-books is a good example of how these collaborations can create game changing opportunities for some businesses and the threat of marginalisation for slower moving competitors. Starting to communicate is not a requirement for innovation staff only but an innovative culture is required. Seven in ten of the executives interviewed by PwC also feel that a successful innovation culture relies on the organisation’s ability to foster an environment where smart exploration is encouraged even if does not always lead to a successful outcome. Leaders know that breakthrough innovations require exploration of entirely new types of business models and technologies. Sometimes, the experiments do not provide the expected results. Sometimes called a failure, those unexpected results are valuable discoveries that can guide the innovation team to bigger and better outcomes. As we go deeper into creation we see that during the fourth day God made the stars to shine on the earth. Have you ever wondered why would we need stars since we already have light from the sun? Aren’t stars redundant lighting? As companies begin to experiment and have success with social collaboration tools, they will begin to understand what we call the collaboration paradox: adding more information to the mix (so called “social information”) actually can help companies combat info overload by creating additional context that makes it easy to find exactly what you need. The navigation techniques have always used stars as guidance on the ocean. We use “interest graphs” (maps of topics, ideas, or business issues and how they’re interrelated) to make it possible for individuals to navigate through our own oceans of information. Effective innovators have structures and practices in place to make innovation more systematic. This allows them to “control” accidental discoveries, and to be continuous innovators. Such structures include a grassroots approach – empowering employees to act like entrepreneurs – as well as strong leadership backing and centralised support. 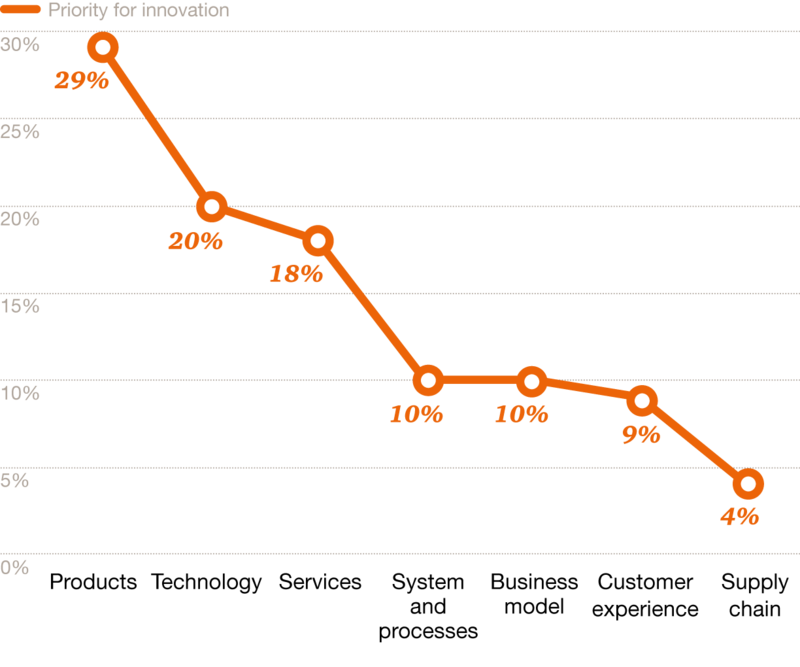 The leading innovators in PwC’s survey have clear preferences for a more structured innovation approach. Only a fifth (21%) of the most innovative companies manage innovation informally, compared with a third (32%) of the least innovative companies. In order to get the leading lights in the ocean of innovations, many leaders are shifting away from total reliance on informal structures. Why would a creator empower creation? We see fruitfulness as one of God’s requirements even for land and sea. Why would we require innovation at all levels? Well, especially in the knowledge days there is simply no other way. A clear indication of innovation’s move into the mainstream is that many companies now expect staff to allocate at least some of their time to developing and supporting new ideas, rather than simply relying on a few bright sparks. Many participants talked about the need “to empower frontline staff”. The fact that talent is quite low down the list would further underline the move from innovation being “alchemy” by the few to “cookery” by the many. 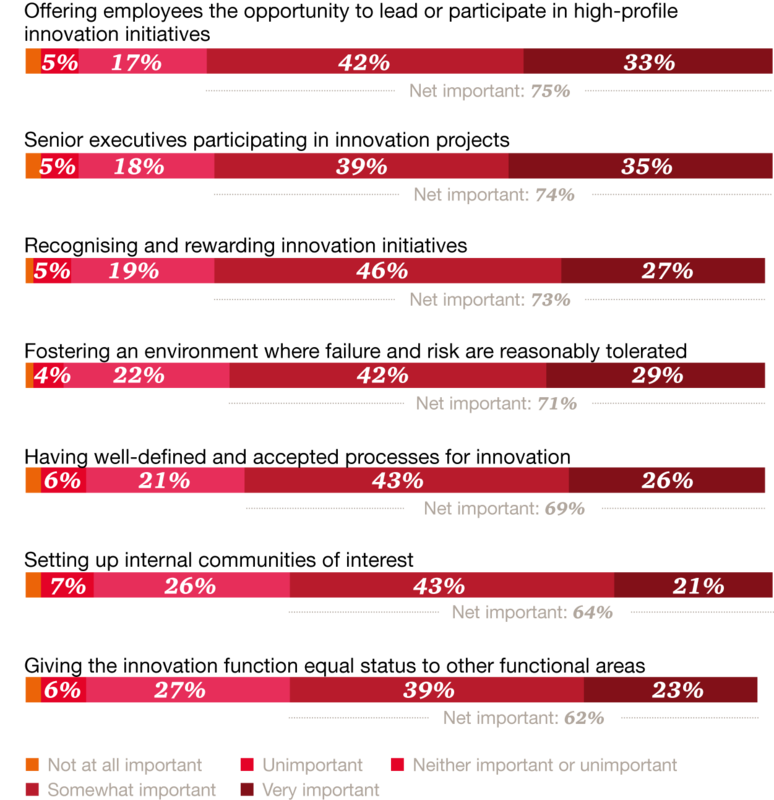 While in the past R&D units would have focused on ways to enhance the product range, the PwC survey shows that many CEOs are looking to go much further by transforming what they sell and how they sell it. A soap powder manufacturer might open up a chain of launderettes or an engine maker could move from selling engines to charging users for running them, for example. What brings these new business models together is a shift in focus from products to solutions. The product is clearly an important part of the solution, but not everything. In turn, the role of technology goes beyond creating new and improved products towards gaining sharper insights into what customers want and how to deliver it. A common thread in the feedback from participants was the need “to spend more time in the marketplace”. The most successful companies have gone further in seeking to create a culture of innovation. However, in keeping with innovation’s changing risk/reward profile this includes giving people extra time to create and nurture opportunities and being prepared to tolerate a level of risk and failure. The beautiful creation days have met a turning point and its effects are still here today. Why? Because there was a disruption between the knowledge Adam and Eve had and the way they decided to act. Interrupting critical knowledge in the decision making process is the turning point where most beautiful stories have ended tragically. Some years ago I began to work on “capitalizing” knowledge in PwC for the EMEIA region, which is a territory covering all offices from the northern countries to South Africa and from the UK to India. This made me look with great interest on the efficiency of information flow and I realised that organizations that have dysfunctional knowledge management begin to suffer the same effects that the Alzheimer disease has on human brain: intellectual abilities are lost, even reach inability to think abstractly, the coordination is limited, and they have trouble performing daily activities. As a result, innovation becomes increasingly rare till it disappears completely. Since its evolution is similar to an organization’s brain, in an article I wrote last year, I named this disease “Knowledgeheimer”. Thinking about an organization as a patient appeared to be making more sense to me when dealing with knowledge management. “Knowledgeheimer” is the turning point that burns a beautiful story into ashes. In 1991, Knowledgeheimer’s treatment involved maximizing the organization’s intangible assets. Later, however, innovation was in the forefront of concerns – materialised into projects like Skandia Future Centre, a prototype to test the operation of new methods of capitalization of knowledge and, in particular, human intelligence within the organization. The basic principle was to stimulate new ideas and creative processes. Today it becomes more obvious that establishing and fostering an innovative culture is a subtle mix of encouraging the right behaviours and giving people the means to take ownership of their innovation efforts. The Innovation Survey offers a glimpse of how this mix would look like. Just as with Alzheimer’s, to combat “Knowledgeheimer”, the organization’s brain should be looked at consistently and intentionally, in a pro-active manner. Access to knowledge retention and taking benefit of this knowledge has to become part of the daily workflow. Article published by Romanian Business Digest, October 2013; PDF copy here. Interesting approach. Thanks for sharing!